Alexander died on the 4th April 1952 and is buried in St Mary’s Old Church Yard in Old Church Hill. He was living at the time in St Georges St. Langdon Hills. 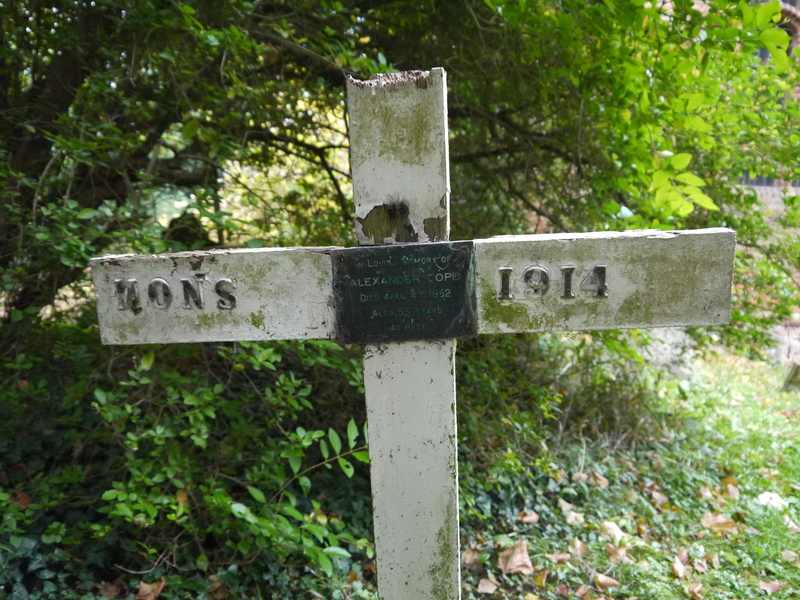 What has always intrigued me is that his grave is marked with a single wooden white cross with the words ‘MONS 1914’. So, it would seem that he was involved at the battle of Mons, the first major offensive of WW1. Awarded 1914-1915 Star, Victory and British Medals. The Battle of Mons was the first major action of the British Expeditionary Force (BEF) or the ‘Old Contemptibles’ in the First World War. It was a subsidiary action of the Battle of the Frontiers, in which the Allies clashed with Germany on the French borders. At Mons, the British Army attempted to hold the line of the Mons–Condé Canal against the advancing German 1st Army. Although the British fought well and inflicted disproportionate casualties on the numerically superior Germans, they were eventually forced to retreat due both to the greater strength of the Germans and the sudden retreat of the French Fifth Army, which exposed the British right flank. Though initially planned as a simple tactical withdrawal and executed in good order, the British retreat from Mons lasted for two weeks and took the BEF to the outskirts of Paris before it counter-attacked in concert with the French, at the Battle of the Marne or the Miracle of Marne, resulting in a Allied Victory and stop the Germans reaching Paris. Being awarded the 1914-1915 Star and not the 1914 star suggest he might not have been at Mons in 1914. The 1914 Star was awarded to those of the BEF who served between 4th August and 22nd November 1914, so why does his cross say ‘Mons – 1914’. So, my question is:- was Alexander at Mons in 1914 or did he serve in the area from a later date in 1914? Very few men who were in action before 1915 survived the war. Irrespective of when Alexander entered the fray, he survived but was he invalided out through injury? The fact that he died young at the age of 56 makes me suspicious. Therefore, my second question is:- is there anybody out there who might remember him or his family, if so please get in touch.